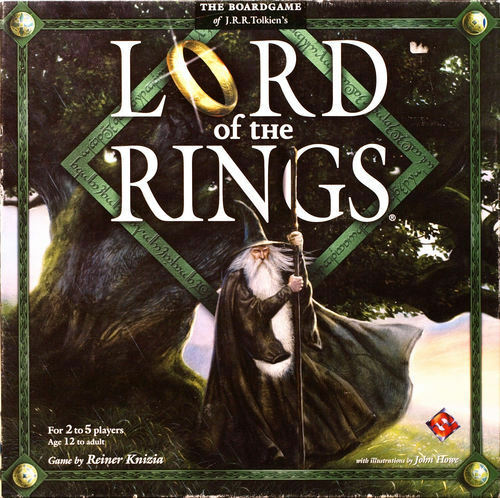 For any family with children, and fans of the Lord of the Rings (without it, the game may not be as fun/meaningful), this is a game that we highly recommend. At the Blackwell residence we've played it with children as young as seven. The younger ones need help but children around 10 or older can handle the game without difficulty. 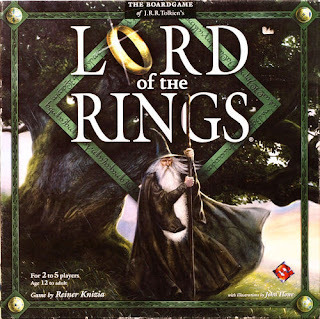 The aspect that we really like is the fact that it's a co-operative game rather than a competitive one, where the players must work together against the game itself to avoid the corrupting influence of Sauron and destroy the Ring of Power. The rules are very unique to support this concept, but work very well. Be warned, however, this game is very tough to beat, even once you've "figured out" the "tricks" to it. Even when the players work together, victory is far from assured, and disaster guaranteed if they don't cooperate. The game is played on two game boards, one that tracks the progress of the Fellowship and monitors each member's level of corruption, and the other is in fact a series of four boards that represent the four "scenarios" that must be traversed -- Moria, Helm's Deep, Shelob's Lair, and finally Mordor. 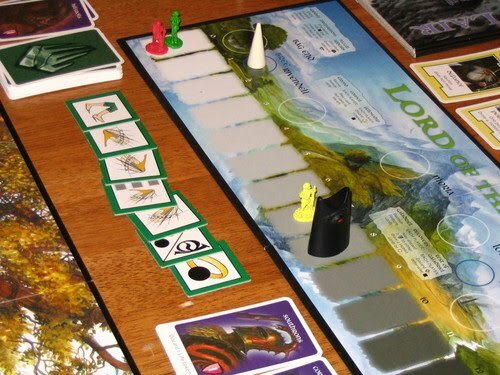 Below is a picture borrowed from Board Game Geek showing the two boards, the one on the left being what we've called the "scenario board" with white markers showing the fellowship's progress on three different tracks (only one of which must be fully traversed to beat a scenario, strictly speaking, but with important items to be collected on the others). On the right is the board showing how close to succumbing to Sauron the hobbits have gone. 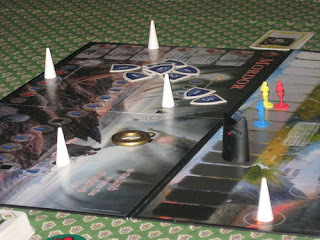 The game mechanics involve the use of tiles and cards. Each turn, each player in sequence must draw a tile with a symbol on it that corresponds to one of the three tracks on each scenario board. This will then allow the Fellowship to progress one space on that track. Moving along the tracks, they will collect shield tokens which can be used to purchase special Gandalf cards (which come in very handy in a pinch), or to try to counteract some of the events that can occur whenever someone draws one of the dreaded event tiles -- which general involve bad things that happened in the novel. The secondary tracks also provide heart, ring, and sun tokens which must be collected by each player before the end of a scenario otherwise they will take "corruption" and move closer to Sauron. They are also dealt a hand of cards which may be used to progress further on these tracks. Special cards received at various places in the game bring non-hobbit characters like Aragorn, Boromir, Gimli, et al into play. Aside from the co-operative play, another nice aspect of this game is that it can be played in about 60 minutes (rather than the hours upon hours that many of our favourite games involve). It also can be played with as few as two players which is a rare treat for occasions when there isn't a whole family or group of friends available to play. The only downside is that it may have limited appeal to people not interested in Lord of the Rings, although if they've at least read it or seen the films (which most people have) they should enjoy the game. On the whole, we find it to be a most unique, enjoyable, and challenging game. Be sure to keep track of your scores on the sheet that is provided for the purpose. It being so hard to actually beat the game, this adds a level of at least trying to beat your previous best score. 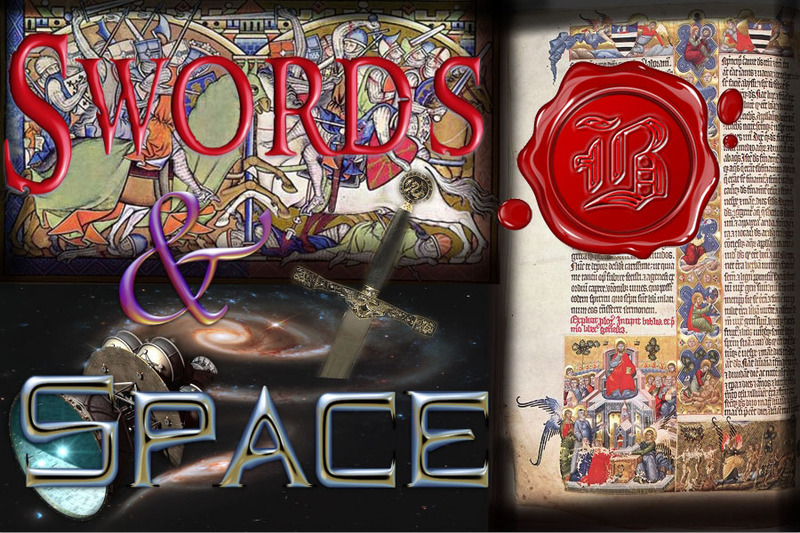 All of us as Swords and Space give it 5/5 stars.